International efforts to limit greenhouse gas emissions are insufficient to avoid the risk of impacts arising from climate change and sea-level rise. Adaptation will be necessary to address these risks. In considering whether an adaptation action is necessary to address risks at a particular place and particular time, the damages avoided by undertaking action can be compared to the costs of that action in order to evaluate the net benefit. In identifying the net benefit of an adaptation action, it is not sufficient to consider only the avoided economic costs of climate change impacts, for example on property and infrastructure. It is also necessary to take into account the avoided impacts on health, recreation, security, biodiversity, sense of well-being etc. Efforts to limit greenhouse gas emissions are insufficient to avoid the risk of impact from Climate change and sea-level rise. International efforts to reduce emissions of greenhouse gases are increasing. Nevertheless, there is growing recognition that these efforts will be insufficient to limit global warming to 2oC or less (relative to pre-industrial amounts), the level widely regarded as leading to dangerous climate change. Climate change impacts are therefore inevitable. The risks from climate change and sea-level rise are particularly high for Australia’s coastal areas, where the majority of the population and infrastructure are located (see Climate change and sea-level rise in the Australian region). Some of these risks can be evaluated in terms of the number of lost assets and the economic value of those assets, as set out in Box 1. In addition, there are non-material, intangible elements at risk, which have social value – the recreational and aesthetic value of the coast, landscape, culture, community cohesion, attachment to places etc. (Graham et al. 2013). 157,000–247,600 residential buildings are potentially exposed to inundation with a sea-level rise scenario of 1.1 metres. Nearly 39,000 buildings are located within 110 metres of ‘soft’ shorelines and at risk from accelerated erosion due to sea-level rise and changing climate conditions. The current value of existing residential buildings at risk from inundation ranges from $41 billion to $63 billion. 27,000 - 35,000 km of roads and rail are at risk, with a value of between $51 billion and $67 billion. These figures are calculated on a 2008 replacement value, and do not take into account future population growth and associated development. The latest IPCC Assessment Report (IPCC 2013) puts a figure of 0.52 to 0.98 m on sea-level rise by 2100 for RCP8.5 (the high emissions scenario). However, sea-level rise will undoubtedly continue beyond 2100, and the IPCC figure is considered likely, i.e. there is some probability that sea-level rise at 2100 will exceed this value. In some places, and at some time, adaptation will be necessary to address the risks from climate change and sea-level rise. Some strategies available to manage the coast under climate change and sea-level rise are outlined in Table 1. 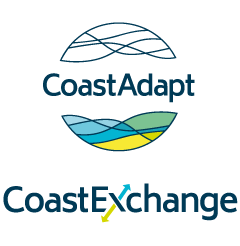 For a particular area, adaptation policy is likely to involve a mixture of these, depending on factors such as land and property value, and erodibility of the coast. An important first step in designing a policy will be to decide when to act, taking into account the expected risks and their timing, the social and economic values at risk, and the costs of action (for more information see What is a pathways approach to adaptation? and Applying a pathways approach). The totality of the cost of inaction: beyond the simple economic costs and the social values of lost assets, for example, there may be the risk of litigation arising from failure to act. The value of co-benefits from adaptation: for example artificial wetlands created to protect biodiversity may also protect infrastructure. Uncertainty: a cost-benefit analysis may provide a false sense that costs and benefits have been precisely captured in monetary terms, but in fact there is substantial uncertainty around such estimates, especially when costs are being calculated over the very long timeframes associated with climate change. Adaptation will have to take place over time, and actions are likely to be staged as the risks increase. Thus, a first step to address the risk from sea-level rise might be to install new return valves on drains, followed by a new bridge in 20 years time, followed by buy-back of properties in low-lying areas at risk, and so on. Quantitative techniques such as cost-benefit analysis can be useful tools for making decisions about large investments in adaptation actions. See Valuing adaptation options and avoided impacts for an overview of valuation methods. Quantitative approaches to valuation enable decision-makers to compare the cost of damages avoided with the costs of adaptation actions. Without such an analysis, it is too easy to be persuaded that action is necessary and beneficial; in some cases, however, the costs may be such that a better solution is to do nothing, or to undertake an alternative action at lower cost. There are multiple values that are not revealed through market-based approaches such as cost-benefit analysis. Figure 1 shows the ‘lived values’ that may be affected by sea-level rise. Techniques such as multi-criteria analysis can capture non-economic values, and rank their perceived importance for communities, but may struggle to assign a quantitative value to these. However, understanding of the lived values that are more or less important to a community may help to develop sensitive adaptation strategies, and to guide more equitable policy response. There are ethical questions around placing a monetary value on something like the loss of a species or a valued place. Moreover, whatever value we choose to place on that loss, different communities and different generations might assign a completely different value. Some adaptation actions will have knock-on effects on values. A sea wall may affect property values, cause beach erosion and cause local extinction of valued species. It is hard, if not impossible, to capture these knock-on effects using cost-benefit analysis and related approaches. Table 1: Types and examples of coastal adaptation. Source: Tam 2009. Figure 1: Categorisation of lived values that may be affected by sea-level rise. Source: Graham et al. 2013. Department of Climate Change, 2009: Climate Change Risks to Australia's Coasts: a First Pass National Assessment. Department of Climate Change, Canberra. Accessed 18 May 2016. [Available online at https://www.environment.gov.au/climate-change/adaptation/publications/climate-change-risks-australias-coasts]. Graham, S., J. Barnett, R. Fincher, A. Hurlimann, C. Mortreux, and E. Waters, 2013: The social values at risk from sea-level rise. Environmental Impact Assessment Review, 41, 45-52. IPCC, 2013: Summary for Policy Makers. In: Climate Change 2013: The Physical Science Basis. Contribution of Working Group I of the Fifth Assessment Report of the Intergovernmental Panel on Climate Change, Stocker, T.F., D. Qin, G.-K. Plattner, M.Tignor, S.K. Allen, J. Boschung, A. Nauels, Y. Xia, V. Bex and P.M. Midgley, Eds., Cambridge University Press, Cambridge, United Kingdom and New York, NY, USA. Accessed 18 May 2016. [Available online at https://www.ipcc.ch/pdf/assessment-report/ar5/wg1/WG1AR5_SPM_FINAL.pdf]. Tam, L., 2009: Strategies for Managing Sea Level Rise.The Urbanist, 487. San Francisco Bay Area Planning and urban Research Association. Accessed 18 May 2016. [Available online at http://www.spur.org/publications/article/2009-11-01/strategies-managing-sea-level-rise].